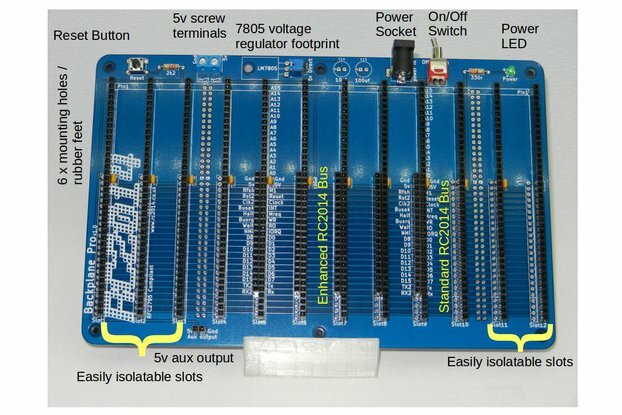 RC2014 is a simple 8 bit Z80 based modular computer. It is inspired by the home built computers of the late 70s and computer revolution of the early 80s. It is not a clone of anything specific, but there are suggestions of the ZX81, UK101, S100, Superboard II and Apple I in here. It typically has 8K ROM, 32K RAM, runs at 7.3728MHz and communicates over serial at 115,200 baud. As a bare minimum, you will need a CPU, ROM, RAM, Clock and Input/Output module. Which Z80 CPU Module Do I need? The standard Z80 CPU Module works great with the RC2014, and the signals that are not normally required are bought out on a header at the top of the module for you to connect wires to if needed. However, if you are using modules that take advantage of the Enhanced Bus, such as the SD Memory Dump Module, and also using Backplane Pro, this module gives you a neater more foolproof alternative. The WAIT, NMI, BUSRQ and INT signals are pulled high via 10k resistors, so there is no need to add or remove links depending what other modules you are using. PCB Only - Go on, guess what you get with this! The is basically just the Z80 with most of the bus decoding etc taken care of by the modules themselves, as a result this has to be one of the simplest boards to build. start with this one! Well thought out kit, easy to assemble. My aim is to produce a CP/M computer using the RC2014. I like the way it is designed in modules so that one can pick and mix. I have the Backplane pro and and have now completed the Z80 c2.1. It went together without any trouble and works a treat. Fantastic kit and well supported by Spencer.